Round One goes to the West Indies. They stood comfortably waiting to punish the weak ball to score off the wayward bowling of the three pace men that Dinesh Chandimal employed in the pre-lunch session. He never thought of a spinner to break a stubborn seventh wicket partnership as rains drove players to the pavilion. It’s on/off cricket at Port O Spain with rains/sunshine taking turns. Round Two is with West Indies. We must remember our medium fast men can take odd wickets on their good days but such good days are far and rare. We have to play the mystery spinners’ as Windies will go beyond three hundred, as our spinners are orthodox on unhelpful wickets. Much-heralded Queen’s Park Oval – the hillocks in front of the stands resemble wasp bite mounds, rising to 2,000 or so feet. Give me any day Pallekele, Hambantota or Dambulla? If superlatives are sought, Dharmasala withTibetan charms, is a place to watch snow capped Himalayas with men silhouetted in white playing with a red ball? Sri Lanka is billed to play in those surroundings in high altitudes on the next tour. Savanna is pretty but the QP Oval is beside a commercial outfit, devoid of the lush greenery around? Crowds are disappointing but a journalist say it is just above the National average attendance at a Test match. Asked why, he elaborated the home team believe they can win but the crowd is not happy with their performance and may drop but if a result materialises the best crowd is best on a Sunday.
. 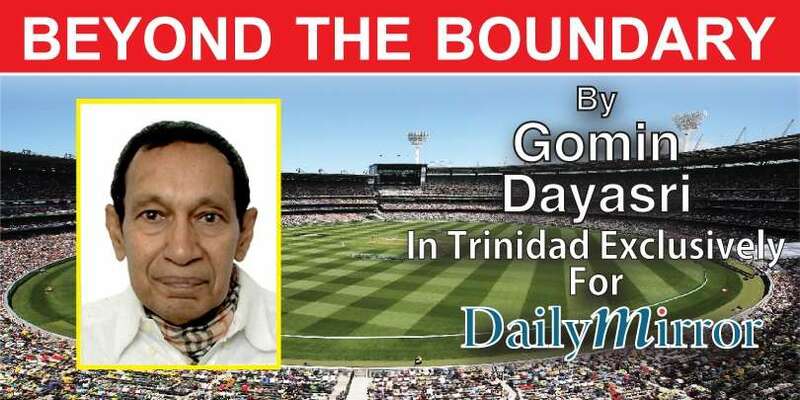 There is another hidden agenda as Trinidad has a sole representative in the test team; Barbados enjoys 7 members in the test team but for the West Indies it is a test win that matters most provided the best are selected. Journalists tell me it is the best within their reach. Good spirit. West indies is playing test cricket from batsmen No 6, after a bashful start-it is more a waiting game. It is a learning curve for our batsmen too in a three match test series.